What you are looking at is the new Samsung Gravity T Ebony that was just released. The original Gravity T Steel was introduced a couple of months ago and now comes the new color. If you love any of the Gravity 2 phone you will certain fall in love the Gravity T’s new design. The full QWERTY slider keyboard is much more easier to use and make every heavy texter happy. Like many other full-featured phones, the Gravity T integrate popular social networking sites into a built-in app in the phone so you can view and update you status through a single page. Although the 2.0 megapixel camera isn’t all that impressive compared to some of the smartphones out there, you can still snap some casual photos and videos on-the-go and share with friends and family instantly. 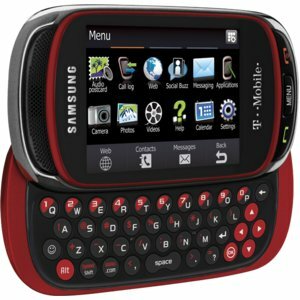 This phone normally cost you over $100 after rebates. For a limited time you can get the Samsung Gravity T Ebony for $0 after instant online rebate. It’s practically free, you don’t even need to pay for shipping.